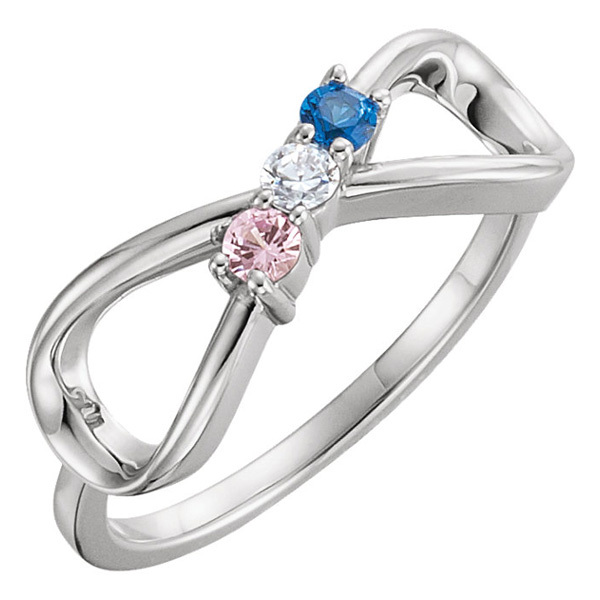 With the chance to personalize the gemstones found in this beautiful 3-stone custom gemstone infinity ring in silver from Apples of Gold Jewelry, you are able to completely personalize a gift for your loved one that she will cherish forever. With three customizable gemstones, each one authentic and measuring 2.5mm in size, you are able to replicate a variety of different looks, or give her a ring that will symbolize the love in your family! The .925 sterling silver ring features an infinity symbol in the front of the ring with the three stones situated inside of it. We guarantee our 3-Stone Custom Gemstone Infinity Ring in Silver to be high quality, authentic jewelry, as described above.